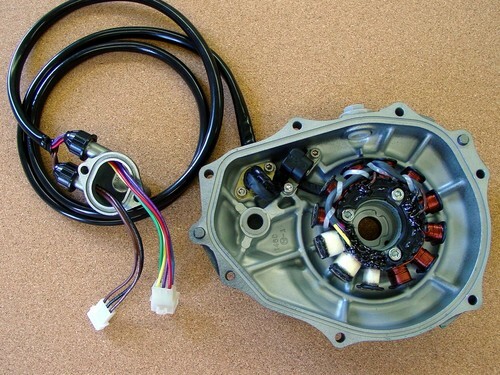 JetSki Solutions only uses the highest grade materials for stator remanufacturing. Many of the materials are manufactured to our specifications. All known modes of failure are addressed. Our stator services are the best value for your money! AND provide better performance! JetSki Solutions, your source for the finest stator services and modifications available today. When you want and need the highest AC volts output for your 1100 ZXI , or 1100 SXR converted standup, look no further. The exciter coils are the heart of your magneto CDI ignition system. All three exciter coils will be stripped and custom wound with the max number of turn and highest resistance specified by Kawasaki. In most cases, this add 50-60 ohms to the normal wind spec, giving the highest AC output at all RPM and thus strongest spark. Please forward a photo of your stator so we can determine if it is a good candidate.